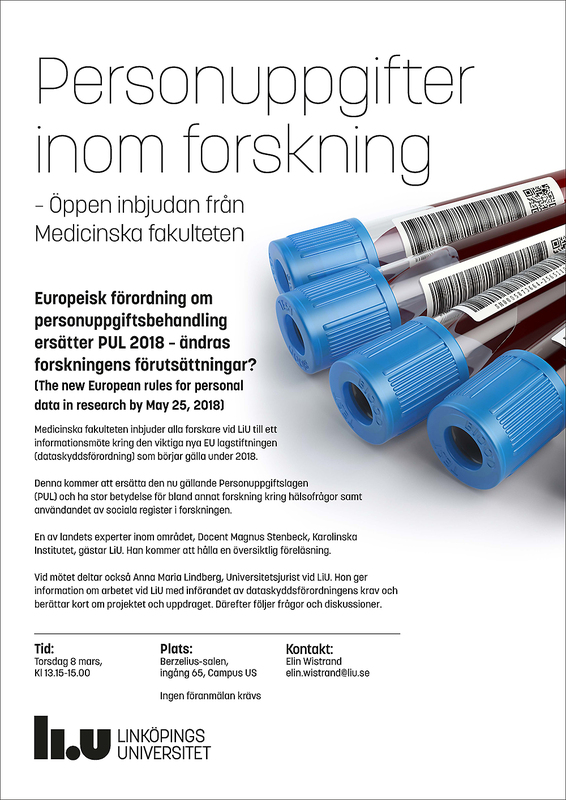 The Faculty of Medicine and Health Sciences invites all researchers at LiU to an information meeting concerning the important new EU legislation (General Data Protection Regulation, GDPR) that comes into force in 2018. This legislation will replace the current Personal Data Act (PUL), and has wide-reaching consequences for, among other things, research into questions of health and the use of social registers in research. One of Sweden’s leading experts in this field, Docent Magnus Stenbeck, Karolinska Institutet, will visit LiU, and will give an introductory lecture (in Swedish). Anna Maria Lindberg, legal specialist at LiU, will also participate in the meeting. She will give information about the process at LiU to introduce measures to meet the requirements of GDPR, and provide a brief introduction to the project and the work involved. A time for questions and discussion will follow the presentations. Berzelius Room, Entrance 65, University Hospital Campus. Registration is not required - just turn up and participate. NOTE: The presentations at the meeting will be given in Swedish, and we expect that the questions and discussion afterwards will also take place principally in Swedish.